B) Polyurethane base mateials such as UltraLeather HP and Duratouch- These materials offer ground breaking technology in a new era of leather alternative luxury offering benefits that real leather can't match like low waste, uniform color and texture, excellent color fastness and superb stain resistance. This adds up to low production costs now and lower maintenance expenses down the road. This also comes with the comfort that what these materials offer is second to none. Delivering an excellent "soft hand", realistic graining, pliant drape and cooler than leather or vinyl, Catalina Custom never hesitates to recommend UltraLeather HP or Duratouch for any upper end upholstery project. Also available is UltraSuede - an excellent faux suede to compliment UltraLeather HP or Duratouch. C) Vinyls such as Softside, Boltaflex, Morbern, Eduratex and Naugahyde. These are great for upholstery projects when trying to hold down cost. Being very cost effective for the benefits of a wide range of colors and patterns to choose from, new technology in the production of vinyls offer excellent durabilty while providing good comfort with an excellent soft hand. D) Cloths, such as Sunbrella and Outdura are choices that are available in a solution dyed acrylic canvas. Solutions is a very durable, tweed based cloth and Phifertex offers a new cloth called Marquesa that has excellent qualities, comfort and durability. 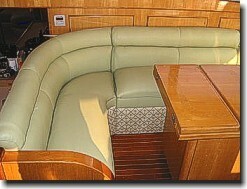 When dealing with interior marine upholstery, one can even start looking at furniture fabric. Catalina Custom has done projects where a state room in a yacht has the same characteristics as a living room in a nice home. 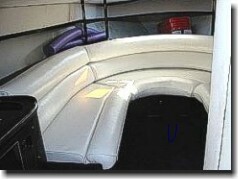 E) Hull liners and headlining material. 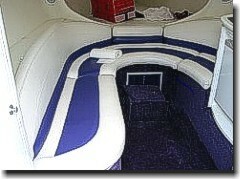 Catalina Custom also provides materials for walls and headliners. 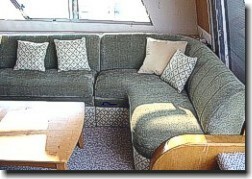 Catalina Custom has done extensive work on boats dealing with interior upholstery, seating projects, wall coverings for decorations as well as padding and covering walls for sleeping comfort in bunks. 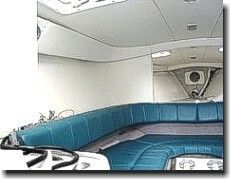 Different boat manufacturers construct boat/yacht interiors differently and over the years, Catalina Custom has come to know that these interiors can prove to be some of the most challenging projects. With over thirty years experience, Catalina Custom continues to see a progression in materials and continues to research the latest material technology with its suppliers. With our experience, we will continue to offer quality craftsmanship and fair pricing.